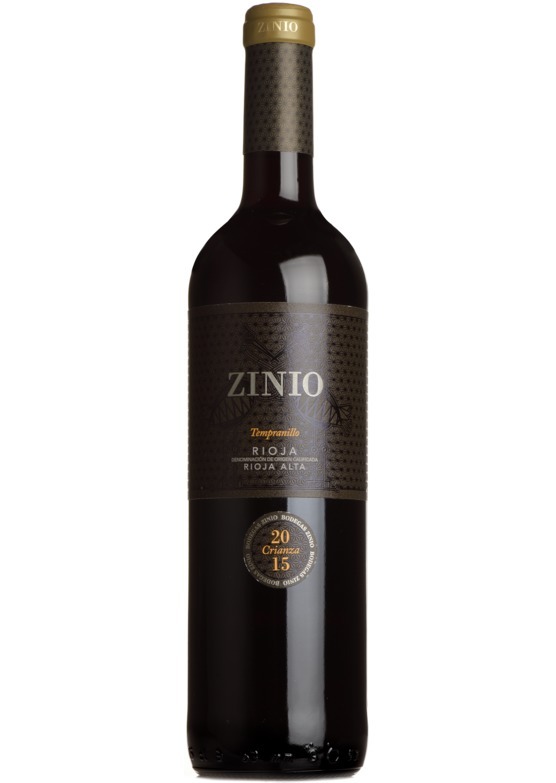 Crafted from perfectly ripened Tempranillo, the grape responsible for Rioja's finest reds, Zinio Crianza offers both complexity and approachability. Having been matured for 14 months in both French and American oak barrels, and hailing from the almost peerless 2015 vintage, this is a drinking Rioja of enormous class and charm. The 2015 vintage has been lauded throughout Europe as one of the finest of the last 50 years - the warmth, and perfect ripening conditions yielding wines of wonderful expression and sheer drinkability. Warm strawberry and plum aromas accentuate an alluring aromatic character with notes of cinnamon spice and woodsmoke. Notably warm and generous with an almost sweet, coulis character to the fruit, but immediately tempered with a luscious freshness. The palate is sumptuous and rewarding, with sun-blushed berry fruit balanced perfectly again with lively cassis and flavours of vanilla spice. Dark chocolate and cherry liqueur follow, enhancing the pronounced berry fruit. Smooth and plush in texture - generous and rewarding, but also light on its feet, modern in style, but classically proportioned, and very much one for lovers of Rioja. Bodegas Patrocinio has been one of Mr.Wheeler’s key producers in Rioja for many years. This fine, and principled collective of family estates is based in the picturesque village of Uruñuela, in La Rioja Alta - the source or Rioja’s very finest vineyards. Patrocinio, managed by the passionate and very Spanish Fernando Villamor, has been on the ‘cuttingedge’ of wine production in Rioja for some years, embracing traditional, barrel-aged Rioja, with its familiar flavours, as well as pioneering new trends, producing modern-style warm, expressive, fruitforward examples, with more contemporary tastes in mind. Earlier this year we met with Fernando and his team in Europe to select a house Rioja from the range, to typify the very best from the region. We were immediately captivated by their ‘black-label’ crianza, a barrel-matured Rioja which we feel is very hard to beat. Exclusive to Mr.Wheeler’s customers, and released onto the UK market for the first time, Patrocinio’s 2015 Zinio Crianza is a must-buy, and is sure to win many friends! Tempranillo is without doubt Spain's most important grape variety. It is a major constituent of most Riojas and in Ribeira del Duero it is so highly regarded that it is often the sole variety in these highly sought after wines. Outside of these two heavyweight regions it found throughout much of the northern half of Spain and in some of the higher altitude regions further south. Tempranillo takes particularly well to oak maturation, most commonly in Spain in American oak barrels. It takes on a sweetness and spiciness that often resembles vanilla, as well as a leathery character that gives the wines an added dimension. Lesser, unoaked examples are often still deep-flavoured, with a jammy fruitiness that is very easy to enjoy. Tempranillo is its most common name, however, if you see Tinto Fino, Tinto del pais, Cencibel, Ull de Llebre or Tinto Roriz on the label you are still drinking Tempranillo. The last one is its Portugese name where it is a major constituent of the great ports and table wines of the Douro Valley.